The caption that accompanies the AP photo to the left reads, "Iraqi children pass by a vandalized mural of the former Iraqi dictator Saddam Husayn in Tikrit." The word "vandalized" would indicate that the graffiti would be negative. 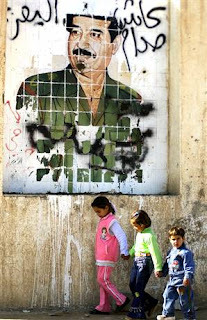 However, the spray-painted Arabic actually reads, "Long live Saddam and the Ba'th (party)." The graffiti underscores the divisions in the country - the upcoming execution of Saddam Husayn will only exacerbate the sectarian and ethnic violence taking place mostly in Baghdad. It also has the potential to unleash a wave of Sunni violence in the Sunni Triangle, in those cities now well known as hotbeds of insurgency - Ba'qubah, Ar-Ramadi, Al-Fallujah, Samarra', Tikrit, etc. As Saddam faces execution - his death by hanging is mandated to take place within 30 days of the denial of his appeal, or no later than January 25, 2007 - many analysts (this one included) are concerned about the convergence of events that will occur next month. In addition to the upcoming execution of Saddam Husayn, there is the ongoing deployment of the 82nd Airborne Division's 2nd Brigade from Fort Bragg to Kuwait to become the theater reserve for U.S. forces in Iraq. The previous theater reserve, the 15th Marine Expeditionary Unit, was deployed to the Al-Anbar province in November. The 2nd Brigade is the 82nd's "ready brigade," the brigade currently on standby duty for rapid deployment as needed. The initial battalion should be in place in 24 hours from deployment order. The fact that the ready brigade is being deployed indicates just how stretched the Army and Marines have become. The deployment of the 2nd Brigade, totally about 3,500 troops, is probably the first of the expected increase in the number of U.S. forces in Iraq. In January, President Bush will unveil his plan for the "change of course" in Iraq. I believe that the decision has already been made that there will be an increase the number of troops, although the exact numbers may not be as high as five brigades (about 20,000 troops). It is interesting that the same generals who in the past claimed they did not need more troops, now do. I say that because the situation - the sectarian violence or civil war, depending on your perspective - has not significantly changed since the February 2006 bombing of the Al-Askari/'Abd Al-Hadi mosque in Samarra' that caused the escalation. If there is going to be an increase in the number of troops, it is important that the President spell out exactly what their mission will be. Will they be dispatched to Al-Anbar or the Sunni Triangle to quell the Sunni insurgency (Ba'this and Al-Qaidah in Iraq, among others), or will they be sent to neutralize the Shi'a militia (especially the jaysh al-mahdi of Muqtada Al-Sadr), or will they provide a security cordon around Baghdad in support of Iraqi security forces who will try to stop the sectarian violence in the city, or perhaps they will be used to bolster Iraqi forces attempting to seal the porous borders with Iran and Syria, the infiltration routes for explosives and fighters? Dispatching additional troops to the Sunni areas does not appear to be necessary. American special operations forces are having great success against the insurgents in Al-Anbar province, as are regular Iraqi and American forces throughout the Sunni areas. Every day, these units conduct "cordon and search" operations against suspected insurgents, terrorists, and general lawbreakers - and are usually successful in apprehending either the primary or secondary targets. Suspects are usually turned over to the Iraqi police, however the vagaries of the Iraqi justice system results in many detainees being released by Iraqi judges for unknown reasons, although it is suspected that ethnicity and religious affiliation come into play. This is aggravating when American troops are killed or wounded in action daily in these operations. Recent assessments by senior U.S. officers indicate that the civil war between the Sunni and Shi'a is the major problem, and that problem is centered in Baghdad. Baghdad is the key - if the security situation in Baghdad cannot be resolved, progress in the remainder of the country is moot. Ultimately, this needs to be an Iraqi solution to an Iraqi problem, but that cannot happen until the security situation is addressed. The Iraqi government, and by this I mean Prime Minister Nuri Al-Maliki, has to eliminate the Shi'a militias, especially Al-Sadr's. This will be difficult because of the close - perhaps too close - relationship between Al-Maliki and Al-Sadr. If Al-Maliki is unwilling to, or incapable of, ordering his forces to disband Al-Sadr's militia - and possibly arrest Al-Sadr for complicity in the 2003 murder of Imam 'Abd Al-Majid Al-Khu'i - then the Iraqis need to seriously consider a change of leadership. January will certainly be an interesting month.